This character family bach has been an icon of Cliff Street for many years. Directly across from the water. A flat walk to the centre of town, close to the wharf for fishing and plenty of offstreet parking available for the cars and the boat. There is plenty of room for the whole family with a great size entertaining deck out the front to enjoy the views, have the BBQ and enjoy relaxing while reading a book. Downstairs is the bunk room - ideal for the teenagers retreat. There's also a room below that has the table tennis table set up ready for those friendly competitions. Please be aware that the time for arrival is from 1pm and the vacating time is 10am on day of departure . Please also be aware that the tariff rate is for two guests only, there is an extra charge for each additional guest. Big fully fenced backyard. Close to town and wharf. Access is by stairs both front and back. Only the road separates you from the estuary and it’s a 10 minute weave down the road to some really good restaurants (don’t miss George’s Beach Club). This is expensive accommodation though - Coming in at just under a grand for 2 nights (7 people) the kids stayed in a converted garage and veranda that gave up the fight to be insect free and they sported even more insect bites than the adults. This has all the stuff you need to get by but there’s not a lot of love or money spent on the property. Facilities (including bedrooms and toilets) are miniature and all of the furnishings escaped second hand shops in the 70s. It Misses being cosy because of the lack of love. Yip, you get a bath but there’s so many warnings about water usage being metered guilt drives you under the house to Share the shower with the cockroaches. It’s clean but very worn out. There is a cot in the twin bedroom and a double bed in the main room. If you want a long stay there’s loads of books and toys for toddlers. There is NO wheelchair access, if you have mobility issues this is a no go - not only will you struggle with the stairs the shower is downstairs and the toilet cannot fit a human being with a walking stick. Thank you for your review of our property in Raglan. We are sorry you were not able to enjoy Fairview for what it is and what it has to offer. Fairview is advertised as a "character family bach". It has been in the family since it was built more than 70 years ago. Over this time it has been lovingly cared for and carefully furnished in keeping with its age and character. It is in an amazing position with the sea just across the road. Fairview has been built up high (hence the stairs, which incidentally are clearly shown in the photo on the website) in order to capture the stunning views. There is no suggestion that this property is suitable for wheelchair access. There have been modifications made to the house over the years but these have been limited by the original design of the house. It is still a comfortable and homely bach which we are proud to let through HomeAway. Thank you for your review of our property. I need to explain that the bathroom and toilet are on the same level as the house and are just outside the back door. Thank you for your suggestions. We have taken them into consideration and now have a new torch and hair dryer. Good kiwi bach with a great view and close to town. Awesome Kiwi Bach in a Great Location! We loved our stay here, the Bach was in an amazing location only walking distance to the town/swimming areas. The house was dated but we loved it and it worked very well for us! The back yard is massive and fully fenced off so great for the kids to run around! Toilet and bathroom is external to the main house which was fine for us. A clean and comfortable old school charm at fairview. 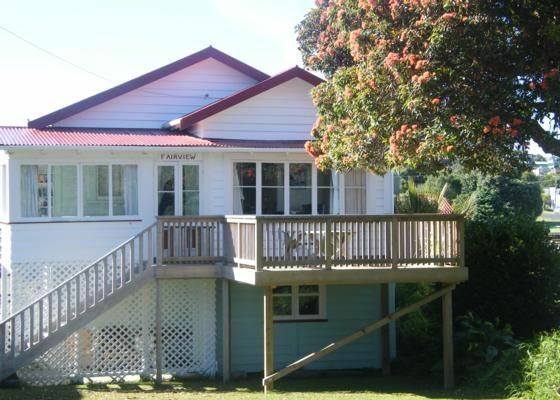 Close to town with the beach across the road and stunning views on quiet street.